I recently wrote a post entitled Getting to Know You in order to share a few things about myself with you. One of points I shared related to my fear of stairs. Open stairs are a complete no go. Unless I am forced to go up them or have no other choice to get to where I need to be, I am not going up them. Thankfully this isn’t a day to day issue. The daily issues I have relate to going up and down stairs. When ascending stairs I have to hold on to the handrail, usually for dear life, and my foot must be touching the front of the next step in front of me. The higher I get, the more panic I feel, I start to feel dizzy and by the time I reach the top I am convinced I am going to fall. When descending stairs again I am holding on to the handrail and I am very very careful when coming down. If the staircase is tall enough I sometimes have to come down step by step by step, which unfortunately is the case with the staircase at my office. I am convinced that I am going to miss a step and if I let go of the handrail I immediately go very dizzy. Unlike the fear of spiders or claustrophobia, this a phobia that I have to deal with on a daily basis and something that I am more than used to being made fun of for. I constantly let people go in front of me as I can’t stand anyone being behind me on the stairs, especially as they usually make fun or try to hurry me along which sends me into near hysteria. The fact that I live in a bungalow has been brought up on many an occasion as to the reason why I feel like this, but I am up and down two very large flights of stairs at work five days a week so I can’t see that as being the reason why. I’ve never fallen down stairs either. I’d really be interested to know if there is anyone else out there who has the same symptoms as I do, and would ask, how do you deal with it and have you have any help? I can somewhat relate--not as extreme but stairs do make me nervous, I have to be holding on to the railing or touching the wall or else I go step by step usually, when going down it's much more of an issue when going up. And I have to look at my feet when going down stairs, if I'm carrying something big and can't see my feet I do panic a bit and in those sorts of situations I try to take the elevator if it's an option, otherwise I will go step by step again and be kind of panicky. I live on the third floor of my building and the elevator is really inconveniently located though so that's unfortunate. I don't really have any tips for dealing, though, this is one of my minor issues in life so if this is a major one for you I'll just say you're lucky that there's nothing worse. Sorry, I know that's annoyingly unhelpful. But trust me when I say my real issues are to the point that before you pointed it out, I never thought of my mild fear of stairs as even being an issue at all. I also have this fear. Its slightly more founded than yours, but I'm a firm believer in not sharing the root of fears with someone else who is scared, and therefore giving them even more reason to be afeared lol. Perhaps living in a bungalow is not helping you. 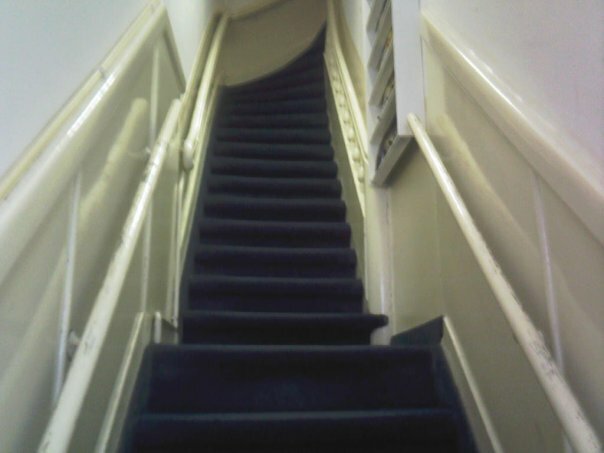 If you found you had to climb a set of stairs every time you needed a wee, or to go to bed, then you might find yourself getting over your fear. Needs must. I make sure that I never avoid the stairs at work for that reason. It is a huge angled flight of stairs and I make sure that I go up and down at least 4-5 times a day. I don't let it affect my life. I do get infuriated though when people laugh at me descending stairs. They wouldn't laugh at someone with a known phobia would they? You haven't always lived in a bungalow. When did the phobia start? It started when I was around 20. I don't think the staircases at work help me much. My old offices were as steep as the Amsterdam stairs and the stairs here are very high and angled. It isn't a major issue, just embarassing. A few years ago I fell down the stais, only 7 or 8 steps, but still I had a serious injury and I had to have surgery. I had a 17 cm plate in my arm and 8 pins! That wasn't the worst part... My arm, the right one, didn't work for almost 6 months. My hand was completly dead and the doctors didn't know if it would ever work again. Fortunately, and because of intense physical therapy it slowly started working again and now (6 years later) it's almost at 100%. It still hurts sometimes, but I just feel I'm lucky! 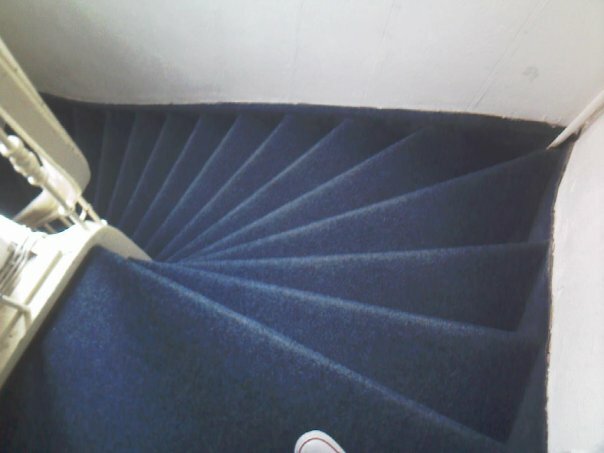 All this story to let you know that after that I was really, really scared of stairs, specially going down stairs. I avoided the tube for years because of the combination of stairs and too much people that could push me off! Now I can climbe stairs with no problem, but I am extra (ridiculously) carefull going down... I just feel dizzy and like I'm gonna fall at any second. It's gotten better, but I think it's because I've been pushing myself. Eventually the brain accepts it. It doesn't mean you'll like it, it just means that you'll no longer think about your fear. So, just breath in really deep and keep doing it! Thank you so much for sharing your story with me. If you can overcome the things you have had to bare, I am sure that I can manage with my own little problem. You are right, I think the more you mentally push yourself, the more you can achieve.